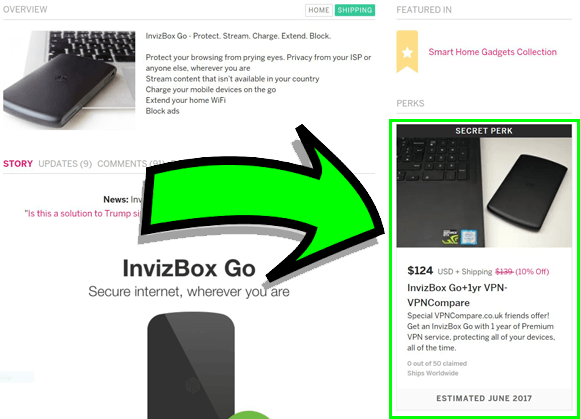 We’ve got a great deal for VPNCompare readers allowing you to save a massive 10% off the leading privacy device of 2017, the InvizBox Go. 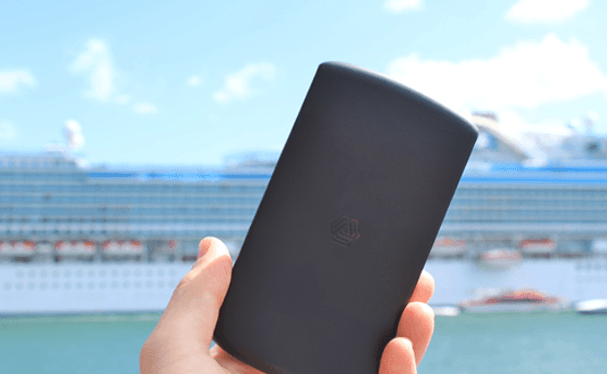 The Invizbox Go is a crowd-funded portable VPN & Tor router that allows you to protect your privacy and alter your geo-location on any Wi-Fi enabled device, even those that don’t have VPN or Tor capability. Simply set the Invizbox Go to connect to a VPN location of your choice, connect the Invizbox Go to your home router or public Wi-Fi access point and then connect your device to the Invizbox Go. Your communications are now secure. To take advantage of this VPNCompare 10% off exclusive all you need to do is hit the huge orange button below which will take you to the purchase page. Upon clicking the button above you’ll be able to select the “Secret Perk” on the right-hand side as can be seen in the image below. After raising €100,000 on crowd-funding website IndieGoGo the Irish team released this their second security device at the very end of 2016. Previously the team released a portable Tor router known simply as the “Invizbox” and it was with this knowledge and prior experience they aimed to surpass the original with an all singing, all dancing security device. So far the Invizbox Go has received rave reviews including our own. It’s a great solution for keeping housemates secure without requiring them to plug into anything or even download any software. … this is a product you should seriously consider. Once of the biggest advantages of the Invizbox Go is its ability to protect devices that don’t support VPN or Tor connections directly. For example if you own a Smart TV and you want to access region restricted content you can’t use a traditional VPN service because there is no way to install the service. By connecting the Smart TV to the Invizbox Go you can access regionally restricted content. This is possible with any other Wi-Fi enabled device too. As well as protecting your privacy at home and while on the move the Invizbox Go doubles up as a 5000 mAH power bank allowing you to charge a mobile phone twice fully with just one full Invizbox Go charge. So what are you waiting for? Click the button below to save now.